LIVING in conjunction with nature and not in opposition to it, is what the people of Masvingo province in southern Zimbabwe are doing. They are using indigenous methods to manage the natural resources of the region. A grass roots organisation, the Association of Zimbabwean Traditional Environ- mental Conservationists (AZTREC), formed in 1980, is assisting and empowering the community to do so. People from all the seven districts of the province have rallied to rehabilitate areas that have undergone environmental degradation. AZTREC is specifically helping the people of Great-Zimbabwe to recover from such baleful practices as the plant- ing of exotic tree species, the development of golf courses during the colonial era, the devastating drought of 1992 and veld (open and unenclosed country) fires, which have taken a heavy toll on the region's natural vegetation. Great Zimbabwe is a tourist attraction in this southern African country. A number of remedial measures have been adopted. Apart from planting of thousands trees, the people have cre- ated wood-lots, nurseries and orchards, in association with the AZTREC. The water source conservation projects established in certain districts have inspired many groups to start activities such as maintaining vegetable gardens, orchards and wood-lots. Several women's groups have been aided in establishing their own nurseries. 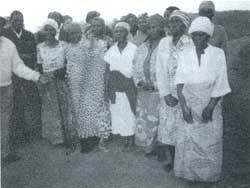 One of them, the Mupata Community Project, had even received the United Nations Environmental Conservation Award in 1992. "We are committed to rehabilitating the land which has been destroyed" said Cosmas Gonese, AZTREC'S executive director. The organisation encourages the locals' ownership and participation in the decision-making of environmental projects designed to sustain community development. Workshops are held to equip people with skills that would enable them to conduct fundamental research on trees. They are also taught how to maintain records with respect to their activities, monitor their wood- lots and fill in time sheets and weekly planning forms. The rate at which protected tradi- tional woodlands of the area were being degraded, worried Gonese. He said, "These woodlands include natural woodlands which had been reserved for the conservation of the habitats of the indigenous flora and fauna. They were also native and important to the region's spiritual beliefs and The green brigade: in conjunction with nature practices." The woodlands are also reserved for the sustain- able production of seeds that would help in tree planting, woody biomass, timber for crafts, fruits and roots, medic- inal plants and humus for improving soil fertility. About 130 ha of woodland in one particular district has been put under the management of the AZTREC. Data on the use- fulness of these natural wood- lands is also being collected. The communities also conserve sources of water such as boreholes by planting trees and other kinds of vegetation around them. Catchment areas of dams, rivers, springs and wetlands are being conserved by the communities which have identified the sources themselves. AZTREC promotes indigenous methods of farming by offering training in permaculture, a method for promoting a sustainable agricultural system. Perma culture provides a source of food income, a part from serving as a model to neighbouring communities. The organisation is also carrying out trials on five species of legumes to monitor their growth rate, levels of nitrogen fixation and biomass. All this is being done with the help of the Natural Farming Network, a non-governmental organisation that promotes permaculture.The aim of the trials is to find viable alternatives for expensive artificial fertilizers and manure which are usually in short supply. While the organisation has registered great success, there remain a number of debilitating factors such as adverse climatic changes, the lack of transport which affects evaluation and monitoring, paucity of additional labour during peak periods, breakdown of equipment, and the lack of incentives offered to nursery attendants. All these shortcomings could diminish the people's morale. What does the future hold for the organisation and the people behind it? AZTREC plans to expand the scale of its operations by setting up more com- munity nurseries, augment humus production through compost-making and increase the sale of seedlings to cover the costs of its operations. The organisation also wants to intensify community participation during peak perio4s. Although its ventures are currently being sponsored through grants and donations from both local and international organisations, AZTREC eventually intends establishing its own financial ventures to sustain its activities.